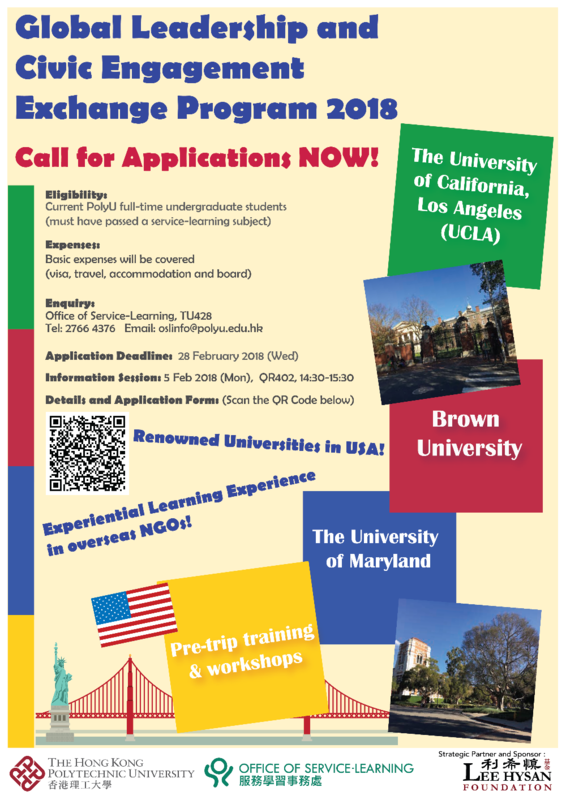 Do you wish to attend the programs organized by the renowned US universities such as Brown University, The University of Maryland or The University of California, Los Angeles (UCLA)? Do you want to work as an intern in non-profit organizations (NGOs) in the United States? Do you Enjoy working in the multi-cultural environment? Do you care about social justice? The Lee Hysan Scholarship for Global Leadership and Civic Engagement Exchange Program 2018 is funded by the Lee Hysan Foundation. It aims to provide support for PolyU students to engage in service-learning (SL) exchange or internship at a recognized overseas university so as to develop students’ global citizenship, broaden their perspective on SL and nurture motivated students to become SL leaders. Current PolyU full-time undergraduate students who have passed a credit-bearing SL subject at PolyU are eligible to apply! Basic expenses will be covered (visa, travel, accommodation and board). For details, please refer to the enclosed Guidelines and Application Form. Copyright ©2018 The Hong Kong Polytechnic University. All Rights Reserved.